These days, finding out whether your’e pregnant is usually as easy as peeing on a stick and waiting a couple of minutes for a smiley face to appear. But in the 1980s-era reign of the Gorgeous Ladies of Wrestling — G.L.O.W. for short — at-home testing was a nerve-wracking nightmare, requiring up to seven steps and more than two agonizing hours of waiting. Caution: Spoilers for GLOW ahead. The stick pregnancy test wasn’t introduced until 1988. True to the organization’s 1985 time stamp, the new Netflix series about these female wrestlers features a frustrating scene in which one G.L.O.W. wrestler, Ruth Wilder, struggles with the complicated chemistry that these tests required. In episode eight, “Maybe It’s All the Disco,” Wilder (played by Alison Brie), holes up in the bathroom after she realizes she’s missed her period. The “Easy to read color result Advance pregnancy test” she attempts to use is practically a high school chemistry kit: it includes a clear plastic tray, two test tubes, a test tube holder, an eye dropper, and a white plastic stir-stick. Wilder pees in the tray — and all over herself — and mixes her urine with two clear liquids. She stirs the solution with the white plastic stick. And then she waits for a painfully long time. Here, 'Easy to read' is a gross overstatement. Pregnancy tests have had the same basic parts since they were developed In 1972, but they haven’t always been designed to be user friendly. When they were first invented by researchers from the United States National Institute of Health, they relied on binding between sheep blood antibodies and the hormone released by pregnant women, human chorionic gonadotropin (hCG). If they bound to each other when mixed together in a test tube, the antibody and the hormone would precipitate out of solution, producing a reddish brown ring at the bottom of the tube. This fairly complex process could only be carried out in a doctors’ office or lab and took up to 14 days to process results. 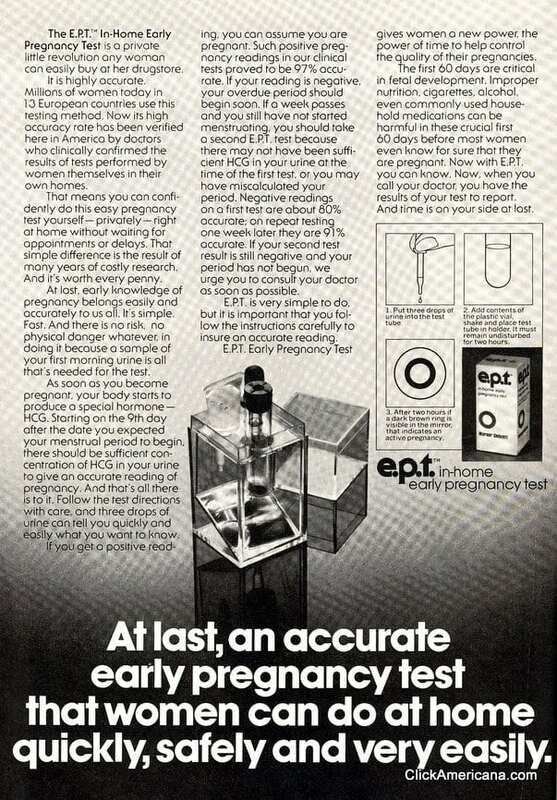 By 1977, the Early Pregnancy Test (EPT) packaged this tedious process into an at-home kit. While this pregnancy test was faster than going to the doctors and waiting two weeks to get lab results, it was still difficult to use: if you accidentally bumped the table the test was sitting on, for example, you wouldn’t get a clear reading. The EPT kit was advertised as being between 91 and 97 percent accurate for positive results and only 80 percent accurate for negative results, which isn’t exactly a reassuring margin of error. In 'GLOW', Wilder is forced to use a seven-step pregnancy test. By the time Wilder would have needed it, the test had only become slightly easier to use. In 1984, companies introduced the color changing pregnancy test, which used antibodies that released dye when they bound hCG. In later versions of the test, the processing time decreased from two hours to 10 minutes, but users still had to go through a series of complicated steps. The most revolutionary change to the at-home pregnancy test happened in 1988, when Clearblue Easy put all the components — antibodies, the color-changing dye, and various other reagents — together on a stick. Unfortunately, this was too late for Wilder. After waiting for what seems like an eternity, Wilder finds out she’s pregnant and is forced to decide between having a child and wrestling. While the pregnancy test she took was cumbersome and complicated, she can’t deny that it offered her a semblance of agency over her own life. Ultimately, it was the test results that set off the chain of events that led her to decide what she wanted for her body and her career. As the series comes to a close, it’s clear that it’s not the last time she does so, either.